When you log in to your merchant dashboard, you'll always land on the Manage store section. This is where you can track sales & orders, manage orders & customers, and set up discounts for your store. 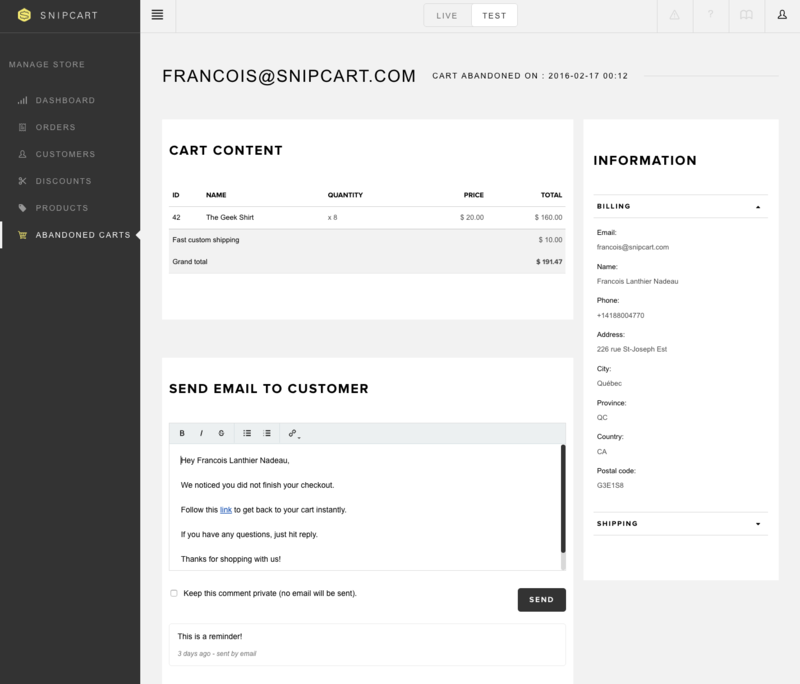 This section offers a comprehensive, visual overview of your e-commerce operation with Snipcart. You will always see a default display of your last month's data when you log in. However, you can filter data by any time period you'd like by using the dates selector. Note: To gather even more actionable insights on your e-commerce activity, we suggest integrating Snipcart with Google Analytics E-Commerce Tracking. 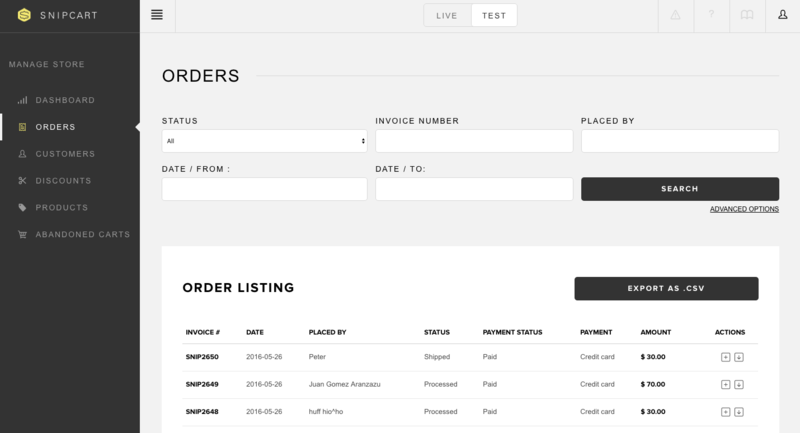 You can export filtered orders as a .csv file. It might come in handy for accounting or importing orders into other systems. You can download the single invoice using the first button on the top right. You can handle partial and total order refunds directly in your order's details page. To do so, click on the refund button on the order details page. Marking the Refund entire order checkbox will set the refund amount to the total order amount. The amount will be rounded to a maximum of two decimals. The amount must be a positive decimal number. The amount must be lesser than the total of the order. 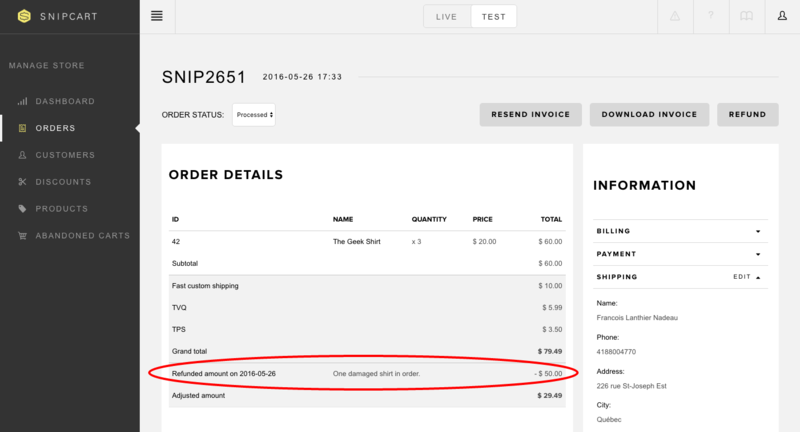 The Reason for refund field is not mandatory, and will not be shown to your customers on their email refund receipt. If you want your customer to be informed of the refund reason, simply mark the checkbox above this field. 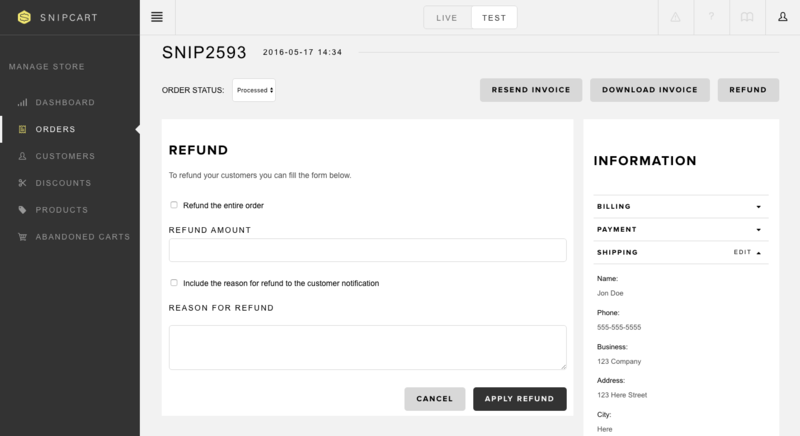 Hit the Apply refund button to send the refund back to your customer. Your customer will receive an email notification for the refund. 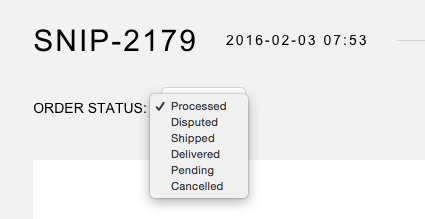 You can associate a shipping tracking number with a specific order in your dashboard. 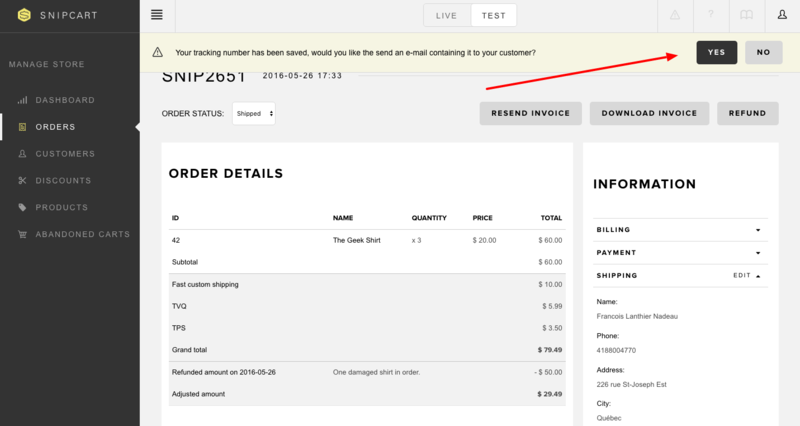 You can also send emails to your customers to share their order’s tracking number. This way, they’ll be able to follow-up on the shipping process on their own if they want to. A notice will pop up asking you if you want to send the tracking # to your customer’s email address. Hit yes. Clicking the No tracking number? Notify customer anyway link will inform your customer that his order has shipped without sharing a tracking number. This section shows the details of a subscription. You will see the subscriber information, the plan details and the list of invoices attached to the subscription. You can cancel a subscription by using the button on top of the section. It's also possible to pause a subscription. Simply click on the Pause button. Once a subscription is paused, you can resume it at anytime by clicking the Resume button. From the subscription details, you can also update it. If you need to change the plan associated to the subscription, the interval or even the quantity, it can all be done from there. Simply click on the Update button in the subscription details and the form will show up. Please note that you can't update a paused or canceled subscription. Important notice: if you change the interval or the interval count, the customer will be charged right away for the new subscription amount. If you only change the amount, the new price will be applied on planned, upcoming invoices only. Confirmed customers are the ones who have created an account through Snipcart on your site. Unconfirmed customers are the ones who have no Snipcart accounts on your site, and have checked out as guests. By clicking on a customer's email in your customer list, you'll access his details page. From there, you can find a historical list of your customer's orders, and information regarding his billing, payment and shipping. 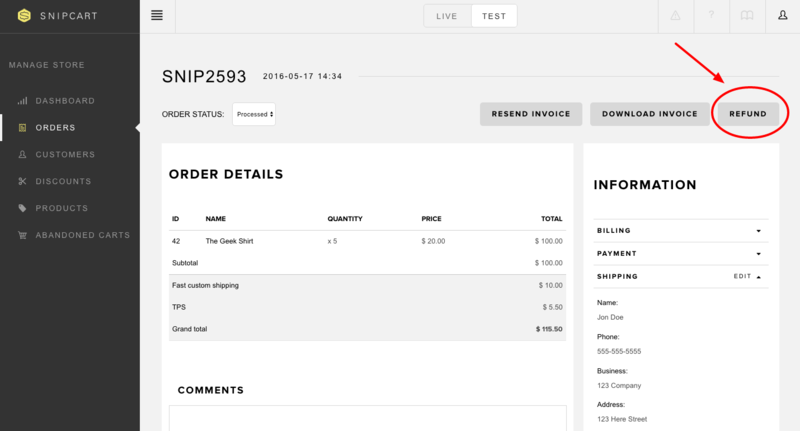 You can use the + sign to see order details and the ↓ sign to download the invoice. 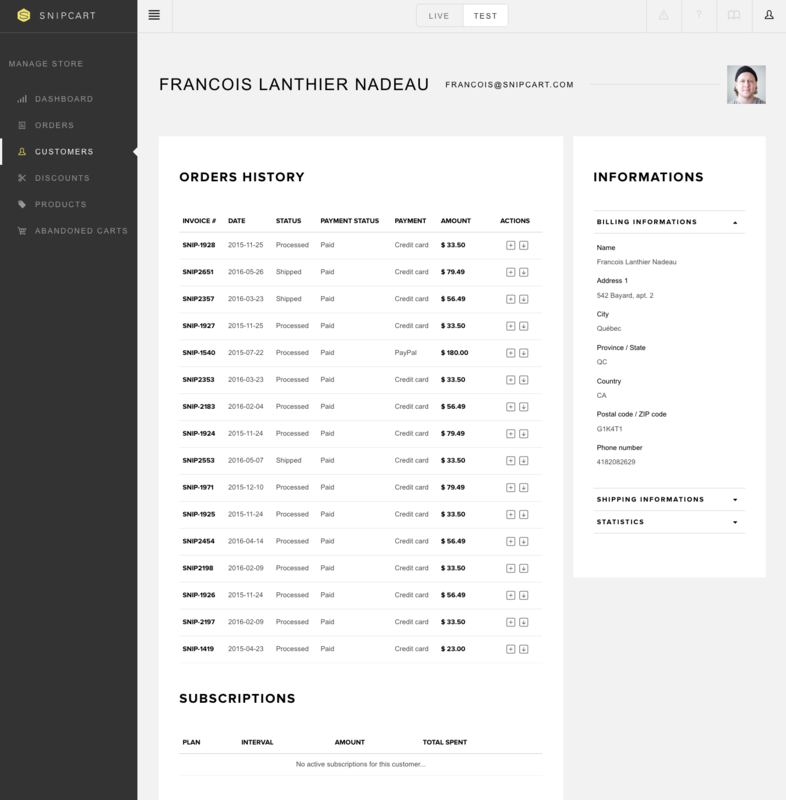 You'll also find an overview of his active subscriptions and recurring payments at the bottom of the order list. Learn more about how to handle recurring payments & subscriptions with Snipcart. 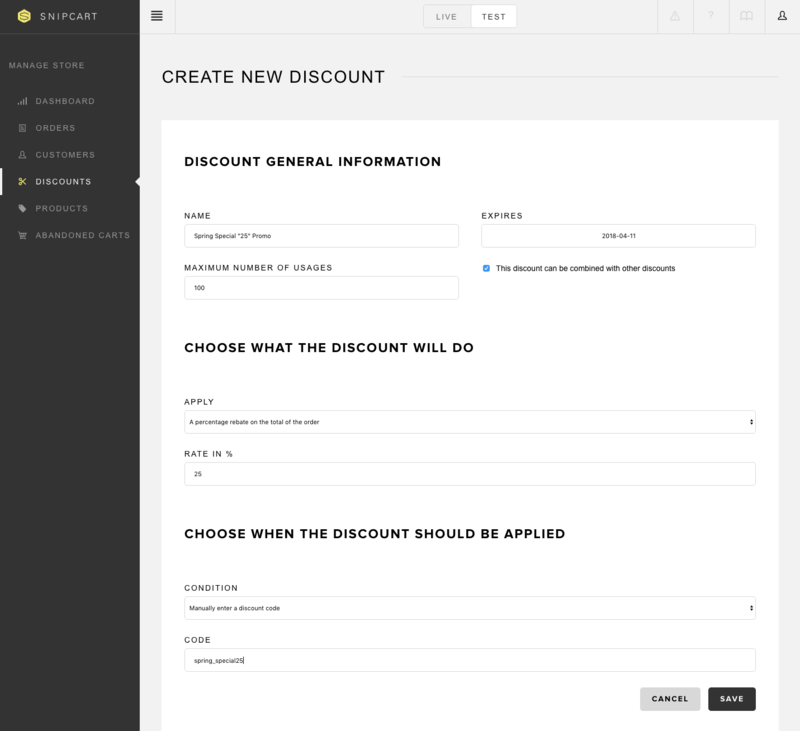 This section is where you can create, edit and delete discounts for your store. Once you've completed the required fields, hit Save and your discount will be active on your store. 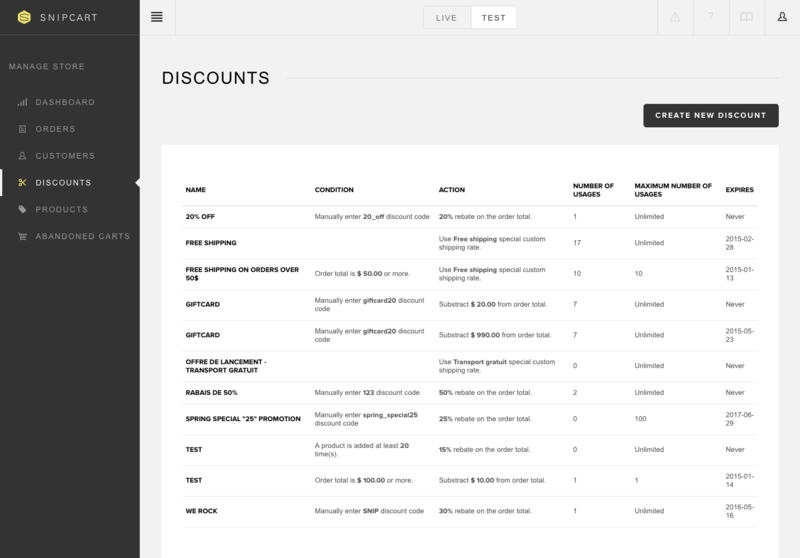 For further information, check out the discounts documentation section. You can also learn simple and quick discount settings with Snipcart. When a discount has been used, you can archive it at any time. The discount will remain linked to the existing orders but will not appear in the listing anymore and will not be usable. Can be useful to soft-delete a discount you don't want anymore. This section displays your store's products. From there, you can gain insights on sales and bestsellers. Products will appear on this page once they've been added to the cart by a customer. If you notice that a product is not listed, it might be because it was never added in-cart by anyone yet. We also said easy-peasy inventory management was available with Snipcart: this is where you'll handle it! Each time a product is added or an order is completed, the statistics will get updated automatically. Note: to use this feature, you first need to activate it in the Store configurations section. From there, the first interactive grid you'll see is the Inventory management zone. 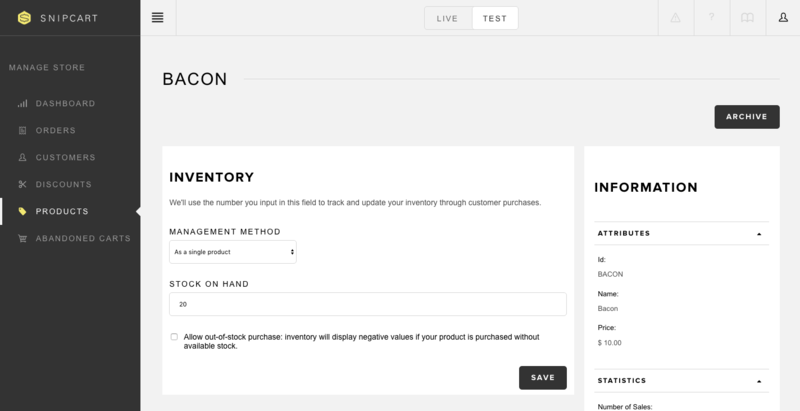 You can choose to manage inventory for your product as a whole, or for your product's different options (e.g. custom fields). 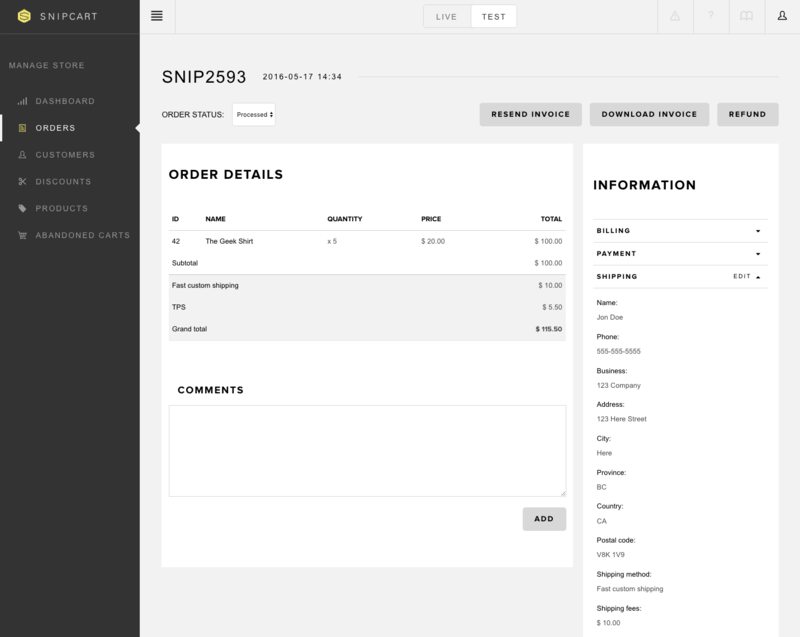 Once you define stock levels for your product or product options, Snipcart will automatically update them in your inventory by keeping track of all transactions on your store. Simply enter the desired numerical value in the STOCK ON HAND field, and hit SAVE. Start by choosing a product option in the VARIATION field (Snipcart will automatically list your custom fields when clicking on the field). Then, enter the desired numerical value in the STOCK ON HAND option. 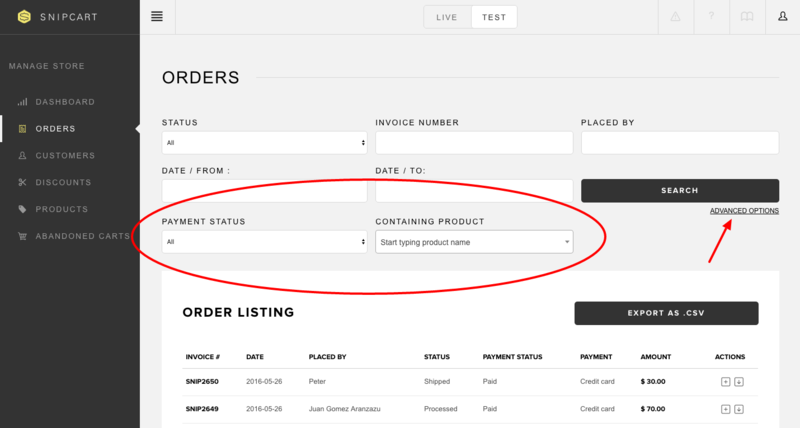 Hit the ADD VARIATION button to repeat the process for every other product option you need. Once you're done, don't forget to hit SAVE. 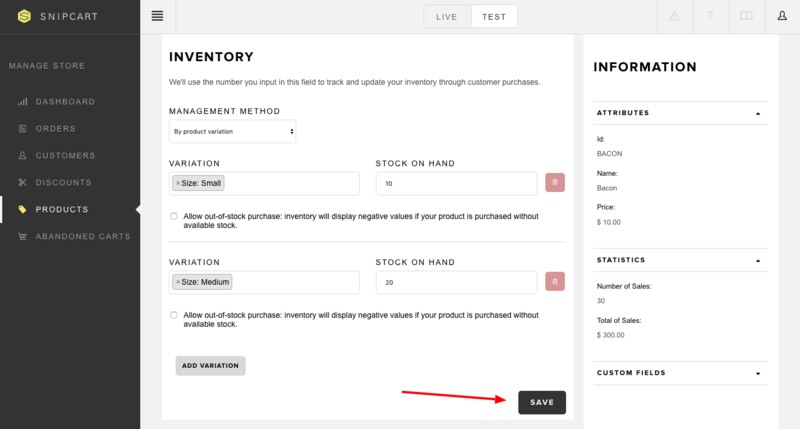 By checking the "Allow out-of-stock" box, your inventory will display negative values if your product is purchased without available stock. We suggest making sure you have a good control over your stock replenishment process if you allow this option! What happens if a customer tries to purchase an out-of-stock item? If you haven't checked the "Allow out-of-stock" box, your customer will receive an in-cart notification that the item is not in stock anymore. It will prompt him to either remove it from the cart, or select another variant of the product if your inventory is managed by product variation (method 2 above). When a customer adds a product to your shopping cart, it shows up in your Products section of the dashboard. 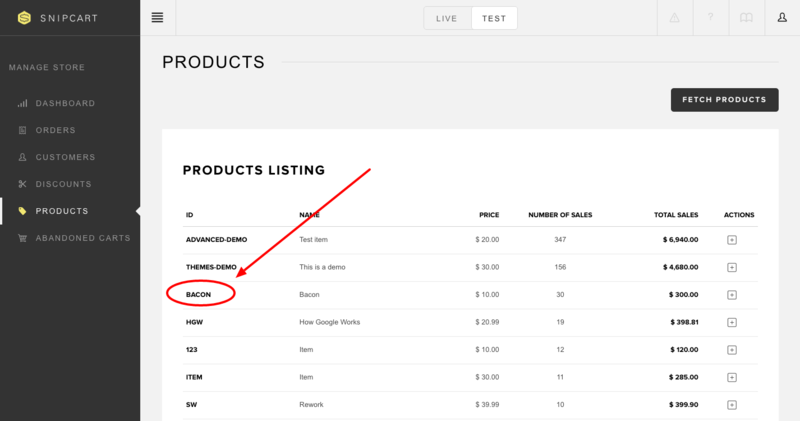 If you wish to list products that haven't been added to the cart yet, you can do it using the Fetch Products button. Simply enter the URL of the page containing your product and hit the Fetch from URL button. 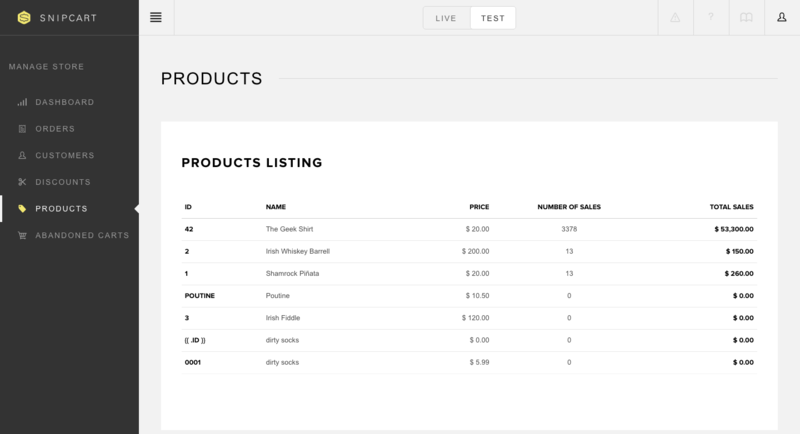 If you'd like to display all of your products at once with this option, simply enter a URL where all of your products are listed. 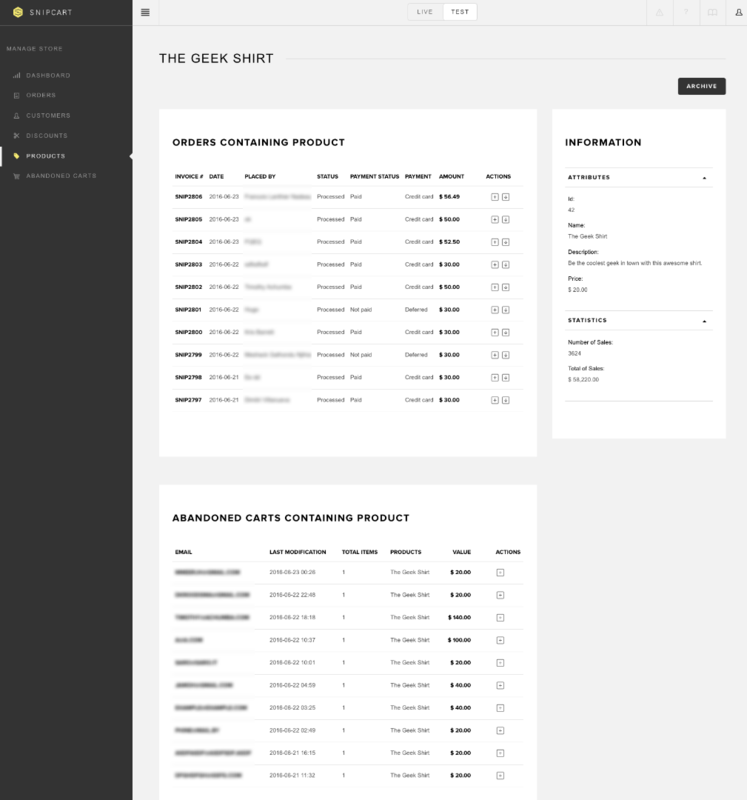 Note: Automatic, site-wide products fetching is in the works and should ship soon. This section displays your store's abandoned carts. The list shows all the shopping cart checkouts that were initiated but not completed on your site. Define your search parameters, hit Search, and a filtered list of your abandoned shopping carts will display on the screen. 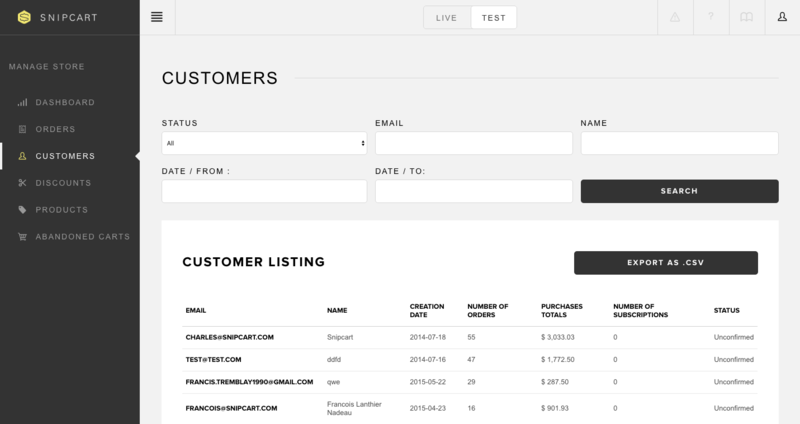 By clicking on an email address in your abandoned carts listing, you'll access the abandoned cart details screen. As of right now, the subject of the email cannot be changed. However, we'll soon release an iteration of our abandoned cart feature that will allow this. In this section, you can create automated email campaigns to recover carts abandoned by your customers. A campaign is a multi-step process (max. 3). Each step represents an email triggered by "time since abandonment." You can customize email template, copy and associated discount for each step. Note that customers who've abandoned carts before campaign creation date won't receive the recovery emails. Choose a name for your campaign, which will only appear in the recovery campaigns listing above. As of now, the "main" criterion allowing you to target specific groups of carts is the on order above field. For instance, you could create an aggressive recovery campaign targeting abandoned orders above 500 $, and a softer one targeting orders above 50 $. An abandoned cart owner cannot receive emails from more than one campaign. Abandoned carts will always be matched to the most specific campaign (e.g. a 600$ cart owner will receive the > 500 $ campaign emails, but not the > 50 $ ones). the discount you will offer to targeted customers (optional). To add a new step to your campaign, click the "Add new step" button. There is a maximum of 3 steps per campaign. When you're ready to create your campaign, hit the "Save recovery campaign" button at the bottom of the page. By default, the same pre-existing email template will be attached to each step. By clicking the "Edit template" button, you will access our email editor, where you can customize the template as needed. You will find all the information you need regarding our email editor here. You can find more information about discounts right here. The discount will then appear in the default email template and be automatically added to the abandoned carts targeted by the campaign. This sections allows you to manage digital goods. After uploading any type of file (.mp3, .mp4, .pdf, etc.) with a simple drag and drop, you'll be provided with a GUID (identifier number). You'll be able to use this GUID to integrate your digital product in your website, like you'd do with normal products. Refer to the end of the product definition section to see how to use the data-item-file-guid attribute. Click the "Upload" button from the menu or the "Upload first file" button from the empty listing to access this page. To upload a new file, simply drag it into the drop zone. You can also click anywhere in the zone to browse files on your computer. The GUID (circled) that has been generated for this particular file. File access expiry delay: Define the number of days the link you send to your customers will be accessible for. Maximum downloads per order: Define how many times a customer can download a file after the purchase.